Being a priest I often hear belittling comments about church worship and the true nature of church buildings; there is the timeless “I don’t need to go to church to speak God, I can do it from home”, or that old Protestant chestnut “In the Bible, Jesus says to pray in private”, or again, and this is the best one of all, something that crosses all denominations, “I don’t go to church because I don’t like x, or y, or z…” So today I would like to reflect with you on the attitudes we ourselves have towards church worship and church buildings. How do we see our church buildings and how do we approach worship? Do we see churches as sacred spaces, as temples entirely consecrated to the living God? Or do we see them as financial burdens to be passed on to future generations but not really knowing the reason why? Do we think of our churches as “thin places” where earth meets heaven more visibly? Or do we think of them as tourist attractions to be milked to the last penny? Do we see worship and liturgy as the source and summit of our Christian life, something that binds us together in the body of Christ? Or do we see them as outdated practices that prevent us from indulging into our beloved self-centredness? Do we think of worship as consecrated time sets aside for offerings and prayers – when a pure sacrifice is offered, prayers are made for everyone, and blessings and forgiveness are spoken? As we consider these questions, today the gospel of John presents us with Jesus clearing the Temple. In the reading we can observe three things about Jesus attitude towards sacred places and what goes on inside. First, we are told that Jesus enters the Temple upon his arrival at Jerusalem – he longs to be there, he burns with holy zeal for that place. Isn’t this bit of a far cry from our apathy towards churches? Secondly, Jesus speaks of the Temple as his ‘Father’s house’ (2:16), the house of God among his people. How many times do we employ possessive adjectives about churches saying “my” church, “their” church, and so on? Thirdly, Jesus does not dismiss the Temple and its worship, but likens it his own body (cf. 2:19). How often do we stay away from churches because they’re not “our cup of tea”, because we would like them to behave exactly according to our own little schemes? If we look closely to the text, Jesus drives out only certain types of people but not others. For example, He drives out neither the worshippers – who paid for the animals and for the sacrifices, nor the priests – who offered them. In other words, Jesus does not cast out of the Temple those who, like him, used it for its appointed purposes – for worship and for encountering God. Instead, rather tellingly, Jesus drives out those who are using the Temple and religious practices in order to pursue personal interests or even illicit gain; in other words, he casts out those who used the holy place like parasites. 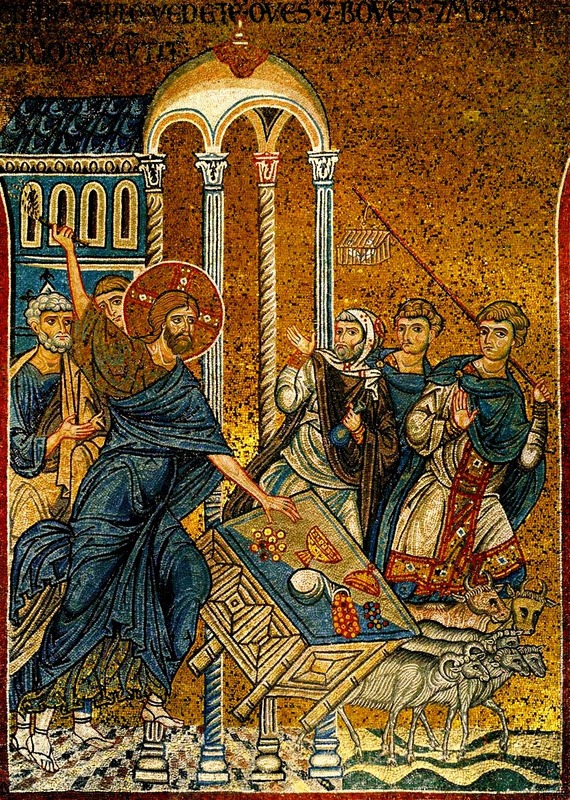 For example, Jesus throws out the money changers and overturns their tables because of the corruption that underlined the business of converting different currencies into Temple money. Jesus drives out the animal stock not to put a stop to the sacrifices of the Old Covenant but because through them worshippers were encouraged to become lazy, to spare themselves the trouble of bringing a genuine offering, something truly valued, from their own homes and to buy a token offerings there instead. Come to think of it, as well as corruption and self-centredness, is it possible that Jesus is casting out “lazy worship”, I wonder? So if we were to reimagine the clearing of the Temple in our days, we could see other type of people being cast out, other people who are seeking after their own, rather than the things of Christ. Who could these be? Perhaps, we could see those who mistake going to church as an excuse to have moral high-ground in society; those who enter ministry to pursue position of power and influence; those who seek praise for their piety; those who employ the Bible as a weapon to bully others into submission; those who preach intolerance and inequality; and yes, also those who occupy pulpits just to push brands of mega-church built around their own successes, their own theology, and the revenue generated by their copyrighted courses on how to be a Christian. Our religion, our worship, and our churches are incredible gifts from God so that the world may encounter him more readily and build a stable relationship with him – the God who longs to be physically present in our midst. To dismiss or misuse of these sacred gifts in order to be fickle Christians or to pursue personal gains are great sins. So this Lent, let us examine closely how we look at church buildings, church communites, and worship. Let us God for true repentance and for forgiveness for all the times we have misused of these gifts and we have behaved like parasites of the Temple, so that we may learn again to selflessly put the liturgical worship of God and the service of others before all other pursuit.